Luscious, moist and naturally delicious, our premium smoked salmon is a gourmet addition to the holiday season. This boneless Sockeye filet is hot-smoked in the traditional Native American style to seal in flavor and tenderness, cooked for added moisture and packaged for optimum freshness. Our salmon is Kosher, 100% natural, with no added oils, coloring or preservatives. It’s a great holiday gift, hostess gift, gourmand gift or a gift for your self! Available in Medium and Large. Smoked salmon is a versatile gift—send a premium filet to a hostess, outdoor enthusiast or your favorite gourmand. 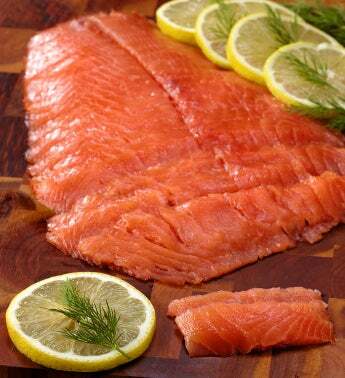 Treat them to delicious and succulent smoked Alaskan salmon. Using centuries-old methods of the Northwest Native Americans, this sustainable wild salmon is slowly cured and smoked to perfection over aromatic fires. Our salmon is Kosher, 100% natural, with no preservatives or coloring added. It’s a great thank you gift, hostess gift or a gift for your self!